Thank you for being part of the Young Bulgarian Voices New York Community! Some of you are nurturing the love for Bulgarian culture for fourteen years already. For others maybe this is the first year joining our Bulgarian language music and singing lessons. Perhaps this is the first time you are finding out about us and the Bulgarian folk dance, Kaba Gaida and Tupan classes we offer and you don’t know yet that we just started Bulgarian Math for kids and Bulgarian for adults classes? Either way, thanks to all of you Young Bulgarian Voices is the giving voice of the Bulgarian traditions in New York and the US – the Kukeri and Martenitzi workshops, Lazarki ritual recreation, Golden Festival in Brooklyn, Verea Dance festival in Chicago, Bulgarian Sabor in Philadelphia, Dance Parade in NYC, Bulgarian National Day concerts… all of the concerts and events in which YBVNY and 101 Kaba Gaidi & Tupani NY are the ambassadors of Bulgaria. Sometimes the rewards of your work don’t need to be so glamorous – hearing your kid reading a story in the language of their grandparents at bedtime makes all the difference in the world! It is almost as rewarding to start a conversation in Bulgarian on Sunday with someone that doesn’t have Bulgarian heritage, but is already in love with the Bulgarian music dances, language and culture. Or maybe even more. 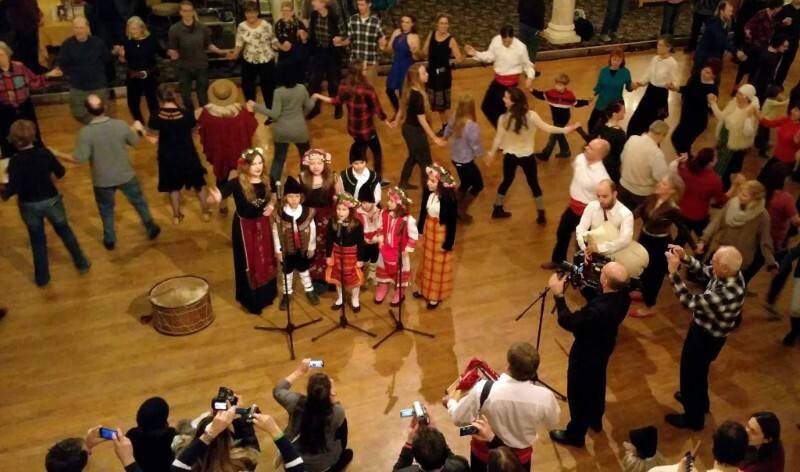 This is why all of you are so special – Young Bulgarian Voices New York is not just a cross-cultural organization connecting people with different cultural backgrounds but is also cross-generational one. You can see it every week when everyone is dancing “Na Megdana” – little kids, parents, teachers, students, dancers, tupan and bagpipe players. Playing, singing and dancing Pravo, Daichovo, Kopanitca, Trite Pati… Or just running around the Horo (the four year olds). YBVNY activities are funded by parent contributions, private and institutional donors and various fundraising activities such as this annual drive. We have made the deliberate choice not to apply for funds that are provided by the Bulgarian government and taxpayers because we believe that under the current economic circumstances, the children living in Bulgaria are in greater need of those funds. Our fundraising goal for this campaign is to raise $10,000 by December 31, 2018. Our wish is to see more children, parents and members crowd the corridors of YBVNY, to witness more happy faces after our workshops and to meet more of you in 2019. Thank you to the the whole community – you are making all of this possible!